Hyderabad, India (12 August 2014) – With 75% of the world’s extremely poor people living in the rural areas and dependent on agriculture, Dr Kanayo Nwanze, President of the International Fund for Agricultural Development (IFAD) underscored the crucial need for rural transformation and gender empowerment to sustainably reduce poverty, hunger and malnutrition, and to drive inclusive agricultural growth in developing countries. Dr Nwanze was on a visit to the International Crops Research Institute for the Semi-Arid Tropics (ICRISAT) global headquarters in Hyderabad where he held discussions with the management and several key scientists on how to elevate the IFAD-ICRISAT partnership to make farming a profitable business in the marginalized regions of the world. “About 80% of the food consumed in developing countries is produced by smallholder farmers, who ironically comprise 75% of the world’s poorest people, 90% of whom are women. If we are to eradicate hunger and poverty, we need to level the playing field by economically empowering small producers, particularly the rural women,” Dr Kanayo said. “Investing in rural women is investing in the community. When women are economically empowered, they make sure their children are fed, get proper nutrition, and stay in school, which in effect can reverse the migration trend from rural to urban areas among the youth,” Dr Kanayo continued. Dr William Dar, ICRISAT Director General, highlighted the importance of the IFAD-ICRISAT partnership. “We share similar goals. IFAD and ICRISAT both aim to eliminate poverty, hunger and malnutrition, and to raise productivity and incomes of poor marginal farmers particularly in the drylands,” he said. “In over 40 years, the CGIAR system has shown that for every US$1 dollar invested in agricultural research for development (AR4D), US$9 worth value is returned on the investment, clearly showing the importance of scientific innovations in coping with food security and rural development challenges,” Dr Dar emphasized. ICRISAT is a member of the CGIAR Consortium, a global agricultural research partnership for a food-secure world. During the visit, ICRISAT scientists gave the IFAD President an insight into the Institute’s work and facilities integrating AR4D across the whole value chain – high-end sciences using genomics and phenotyping, insect rearing and bioassay, community watershed management and crop improvement field experiments, through to village level studies to understand on-the-ground realities of the rural poor, ICT innovations in agriculture, and agribusiness and innovation platform. These areas complement each other as part of ICRISAT’s efforts to provide holistic science-based agricultural solutions to alleviate the plight of smallholder farmers in the drylands. 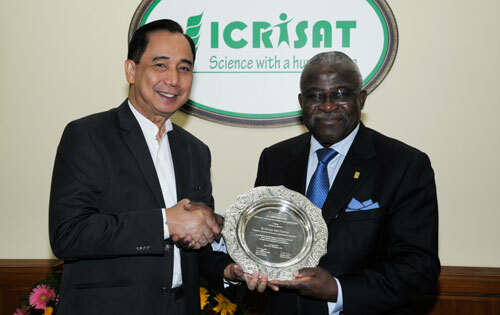 As a highlight of the visit, ICRISAT honored Dr Nwanze with a Special Award as “an outstanding scientist, a global leader in agricultural research for development, and a global champion for smallholder agriculture.” The recognition, which was conferred by Dr Dar, was received by Dr Nwanze on behalf of IFAD at a dinner reception celebrating his fruitful and memorable return to the ICRISAT headquarters in India where he worked as a scientist. Dr Nwanze joined ICRISAT in 1979 as Principal Cereal Entomologist in Ouagadougou, which was the beginning of an 18-year career with the Institute which spanned assignments in Niger for 5 years and at the headquarters in Hyderabad for 10 years. He left Hyderabad in September 1996 to take up the position of Director-General of the Africa Rice Centre which he held until 2006 before joining IFAD. “ICRISAT is the foundation of my professional career globally, and I am humbled by this award. As a former scientist, I have seen with my own eyes what we can achieve when research is people-centered and responds to the needs of smallholders and poor rural communities,” he said in accepting the award. IFAD has supported ICRISAT since its inception – with more than 22 large grants contributing some US$20 million to the research programs and initiatives of the Institute and its partners.